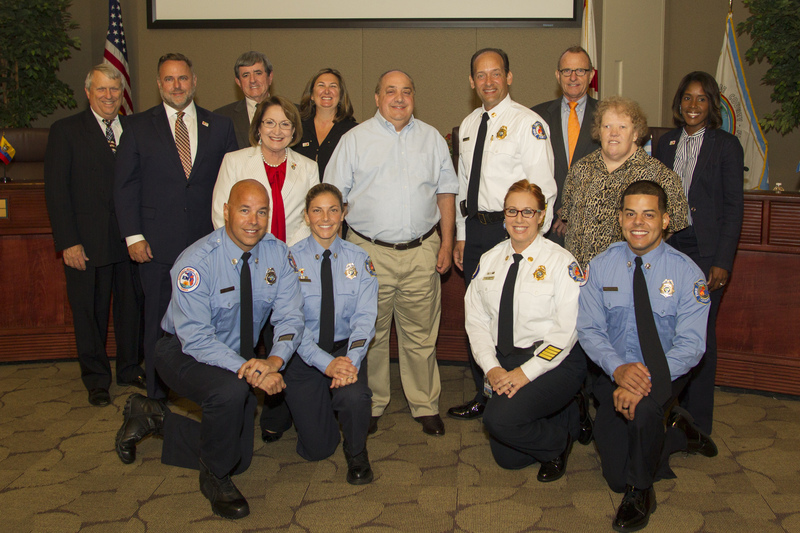 Orange County Mayor Teresa Jacobs, the Board of County Commissioners, Orange County Fire Rescue Chief Otto Drozd III and Orange County firefighters recognize Chef Robert Scambia, joined by his wife Carolyn, at the Sept. 13 BCC meeting for his selfless service to Orange County. Chef Robert Scambia was honored by Orange County Mayor Teresa Jacobs, the Board of County Commissioners (BCC) and Orange County Fire Rescue Chief Otto Drozd III for his selfless service to the firefighters of Orange County during the BCC meeting on Sept. 13, 2016. Chef Rob, as he is affectionately known by the Fire Rescue crews, lost a friend among the 343 firefighters killed in the devastating national tragedy that occurred on Sept. 11, 2001. Since that fateful day, he has made it his mission to cook for fire stations across Florida as a tribute to those who were lost on 9/11 and as a thank you to local heroes who continue to serve their communities daily. When he began cooking for Orange County Fire Rescue, he quickly developed a strong bond with the firefighters. Firefighter and paramedic Maria Bernard of Station 83 found out Chef Rob had been working towards creating a cookbook for years and began a GoFundMe account to help make his dream a reality. Kleenex® found the online fundraiser and partnered with Orange County Fire Rescue to present Chef Rob with the first edition of his cookbook. The resulting video “A Recipe for Care,” which is part of Kleenex’s “Someone Needs One” campaign, is a two-minute tearjerker that has catapulted to nearly six million views on social media in only three weeks. Chief Drozd echoes the sentiment expressed by countless firefighters who appreciate and love Chef Rob. “A Hero’s Cookbook” is available for purchase. All proceeds benefit the Orange County Fire Fighter’s Benevolent Association, a nonprofit organization focused on assisting firefighters in their time of need. See Chef Rob’s heartwarming story and once-in-a-lifetime surprise at #ShareKleenexCare.